Sophie was abandoned at birth and grew up neglected and abused. Her only friends were computers, until she met Cole Hunter. He became her everything: brother, protector, and partner in crime. She believed that nothing could ever tear them apart. Until it did. Years later, when news of Cole’s murder reaches Sophie, she completely snaps. She will tear down heaven and earth to find his killer, even enlisting the help of her ex-military ex-boyfriend. When Cole was nine years old, he watched his whole family burn to death in a house fire. He became obsessed with architecture and rebuilding his life. 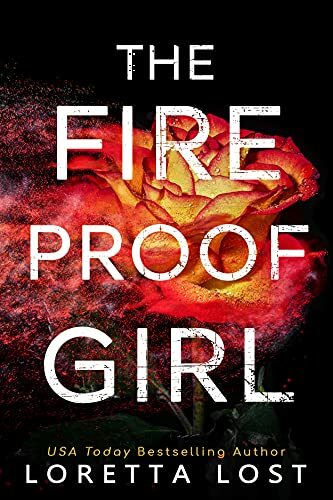 Click here to pick up your free copy of The Fireproof Girl in the Amazon Kindle store. USA Today bestselling author Loretta Lost writes to experience all the love and excitement that can often be lacking from real life. She finds it therapeutic to explore her issues through the eyes of a different person. She hopes to have a family someday, but until then her characters will do nicely. You can visit Loretta’s Amazon author page if you click here. Are you receiving the blog’s posts by email? You can if you click here or type in https://fkbt.com/subscribe into your web browser – just fill in your email address, smack the “Subscribe” button, and make sure you click the link in the confirmation email! Looking for more or a reliable source of free books for your Kindle? Click here for my “Free Kindle Books and How to Find Them” guide. Subscribe to get updates directly to you! You can read this blog directly on your Kindle through our free Kindle Fire App! So, who writes all of these posts to the blog? A gray-haired guy in Texas named Michael Gallagher who doesn’t blog full-time but blogs as a hobby. The Kindle Books and Tips blog has a simple purpose: to provide an interactive blog where you will receive tips to maximize your Kindle experience.